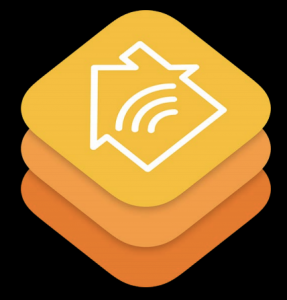 Currently, there are a myriad of different per vendor standards to control home automation products, but Apple are providing functionality to enable hardware (or software) bridges between disparate protocols and their own. Once a bridge has been discovered, the iPhone sees all the devices sitting the other side of the bridge as if they were directly connected to the iPhone and using the Apple provided interface protocols. When devices are first defined, each has a compulsory “identify me” action. Hence if you’re sitting on the floor, trying to work out which of twelve identical-looking lightbulbs in the room to give an appropriate name, the “identify me” action on the iPhone pick list will result in the matching bulb blinking twice; for a security camera, blinking a colour LED, and so forth. Each device, it’s room name, zone (like “upstairs”, “back garden”) and home name, plus the common characteristic actions, are encoded and enacted using Siri – Apple’s voice control on the iPhone. “Switch on all downstairs lights”, “Set the room temperature to 20 degrees C” and so forth are spoken into your iPhone handset. That is the default User Interface for the whole Home Automation Setup. The HomeKit resident database is in turn also available for use by vendor specific products via the HomeKit API, should a custom application be desirable. There are of course extensive security controls to frustrate any attempt for anyone to be able to do “man in the middle” attacks, or to subvert the security of your device connections. For developers, Apple provide a software simulator so that you can test your software against a wide range of device types, even before the hardware is made available to you. Most of the supporting detail to build compliant devices is found in the MFI (Made for iDevices) Guidelines, which are only available the other side of a license agreement with Apple here. The full WWDC presentation on HomeKit (just under an hour long) is called “Introduction to HomeKit” and present in the list of video sessions from WWDC here. So, the only missing thing was talk of iBeacon support. However, that is a different use case. There are already pilots that sense presence of a low energy bluetooth beacon, and bring specific applications onto the lock screen. Examples include the Starbucks payment card app coming forward to make itself immediately available when you’re close to a Starbucks counter, or the Virgin Atlantic app making your boarding card available when you approach the check-in desk at an airport. Both are features of Apple’s PassBook loyalty card app – which is already used by hundreds of retailers, supermarkets and airlines. The one thing about iBeacon is that you can enable your iPhone 5S to be a low energy beacon in it’s own right. You have full control over this and your presence is not made available to anything but applications on your own iPhone handset – over which, in the final analysis, you have total control. One use case already is pairing your Pebble Smartwatch with your iPhone 5S handset, so that if your phone leaves your immediate location by a specified short distance (say, 2 meters), you’re aggressively told immediately. So, lots to look forward to in the Autumn. Quite a measured approach compared to the “Internet of Things” which other vendors are hyping with impunity (and quoting staggering revenue numbers which I find difficult to map onto any reality – starting with what folks seem to suggest is even a current huge market size already). My next piece of homework will be to look at CloudKit, now that Apple are dogfooding it’s use in their own products while releasing it to third party developers. Hopefully, a good sign that Apple are now providing cloud services that match the resilience of competitive offerings for the first time – even if they are specific to Apple’s own platforms. But that’s all the other side of finishing my company’s end of year tax return prep work first! Being an iPhone, iPAD and Apple TV owner I found it interesting, especially the mention of iBeacon what ever that is. Is Bluetooth still a well adopted standard in use still? I still have a Windows PC though running version 7 no desire to go to Windows 8.